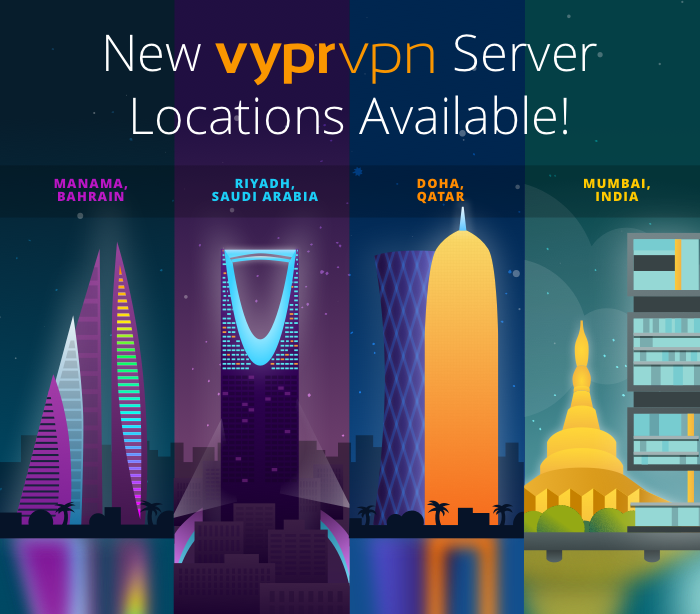 Golden Frog added new VyprVPN server locations in Bahrain (Manama), Qatar (Doha), Saudi Arabia (Riyadh) and India (Mumbai). These additional servers will offer our Diamond and Platinum members security and freedom when accessing the Internet in these regions. We are excited to see the expansion of VPN server locations in Golden Frog's fight to defeat online censorship and to keep the internet open and accessible. At Giganews, we feel it is important to protect your Usenet connections with SSL and protect all of your internet connections with VyprVPN. VyprVPN Mobile - To enable these servers as an option using VyprVPN Mobile, simply log out of the app and log back in. For you Diamond customers out there, we've got a neat thing to share with you from Golden Frog. It's a new feature for VyprVPN called Port Selection, and it's now available for Windows and Mac desktop platforms on the OpenVPN and Chameleon protocols. What and Why Is Port Selection? Until now, VyprVPN has used a default port when attempting to make a VPN connection. Sometimes the port will be blocked or throttled – by a country, university, ISP, what have you – and this can compromise your ability to successfully connect and encrypt your Internet connection. Port Selection solves this problem and allows you to access a wide range of UDP ports so that you can defeat intentional port blocking or throttling. In short, get more consistent and successful VyprVPN connections by using Port Selection with OpenVPN or Chameleon protocols in the desktop apps. Port Selection is only available for our Giganews Diamond account, which comes with VyprVPN Pro. Port Selection works for OpenVPN and Chameleon protocols only. Port Selection can be set to automatic or manual. Automatic will scan the ranges specified to defeat port blocking and throttling. With manual selection, you can enter the default ports (443 for Chameleon and OpenVPN256, 1194 for OpenVPN116) or any port within the specified range. If you're not a Diamond Customer, but you really like Port Selection, you can always upgrade your account from your control panel. Or if you're shopping around for a Usenet provider with VPN, you can get a sample of our Usenet for 14 days free. Be sure to follow us on Facebook, Twitter, and Google+ for more updates like this. Golden Frog Added a New VyprVPN Server Location in Taiwan! 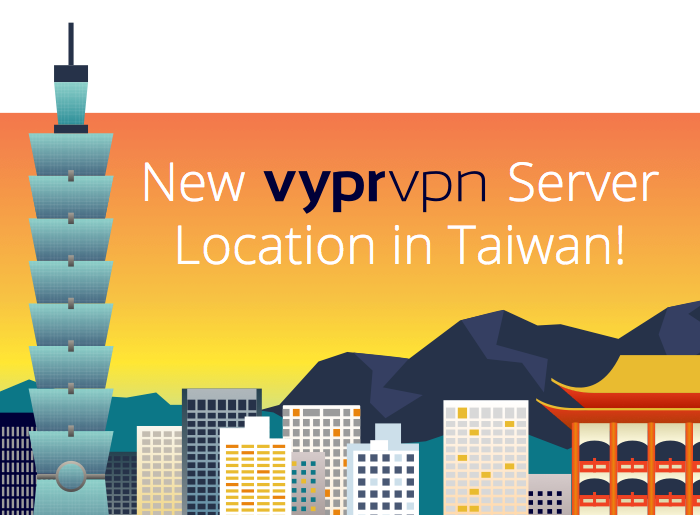 Golden Frog launched a new VyprVPN server location in Taipei, Taiwan. This is the 10th VyprVPN server location in Asia. Golden Frog offers unlimited VPN server switching and never throttles your connection. They have over 200,000 IP addresses so server connections are always available. VyprVPN Mobile - To enable Taiwan as an option using VyprVPN Mobile, simply log out of the app and log back in. Golden Frog Added a New VyprVPN Server Location in Panama! Golden Frog launched a new VyprVPN server location in Panama City, Panama. This is the second VyprVPN server location in Central America. Golden Frog offers unlimited VPN server switching and never throttles your connection. They have over 200,000 IP addresses so server connections are always available. VyprVPN Mobile - To enable Panama as an option using VyprVPN Mobile, simply log out of the app and log back in. Giganews members with VyprVPN have unlimited access to 50+ server locations across North America, South America, Europe, Oceania, and Central America. Golden Frog Added a New VyprVPN Server Location in Costa Rica! Golden Frog launched a new VyprVPN server location in San José, Costa Rica. This is the first VyprVPN server location in Central America. Golden Frog offers unlimited VPN server switching and never throttles your connection. They have over 200,000 IP addresses so server connections are always available. VyprVPN Mobile - To enable Costa Rica as an option using VyprVPN Mobile, simply log out of the app and log back in. Giganews members with VyprVPN have unlimited access to 50+ server locations across North America, South America, Europe, Oceania, and now Central America. Golden Frog Added a New VyprVPN Server Location in Colombia! Golden Frog launched a new VyprVPN server location in Bogotá, Colombia. This is the third VyprVPN server location in South America. Golden Frog offers unlimited VPN server switching and never throttles your connection. They have over 200,000 IP addresses so server connections are always available. VyprVPN Mobile - To enable Colombia as an option using VyprVPN Mobile, simply log out of the app and log back in. Giganews members with VyprVPN have unlimited access to over 50 server locations across North America, South America, Europe, Asia and Oceania. Golden Frog Added a New VyprVPN Server Location in Argentina! Golden Frog launched a new VyprVPN server location in Buenos Aires, Argentina. This is the second VyprVPN server location in South America. Golden Frog offers unlimited VPN server switching and never throttles your connection. They have over 200,000 IP addresses so server connections are always available. VyprVPN Mobile - To enable Argentina as an option using VyprVPN Mobile, simply log out of the app and log back in. Happy Valentine's day! Today's the perfect day to share your love of Giganews with friends and family. When you refer a friend that sticks around Giganews for a month or more, we'll give you up to a free month of Usenet – whatever the value of that account is. Everybody wins! Just log into your control panel here to email, tweet, or Facebook out to the ones you love most, anytime. We would like to wish all Giganews members Happy Holidays and the best for 2015. Without all of our great members, Giganews would not be what it is today. We are honored by all of your support. Golden Frog Added a new VyprVPN Server Location in Seattle! 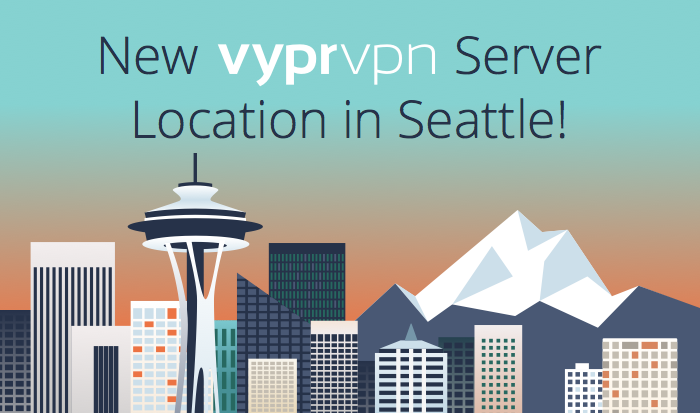 Golden Frog launched a new VyprVPN server location in Seattle, Washington, USA. This is the 8th VyprVPN server location in the United States. Golden Frog offers unlimited VPN server switching and never throttles your connection. They have over 200,000 IP addresses so server connections are always available. VyprVPN Mobile - To enable Seattle as an option using VyprVPN Mobile, simply log out of the app and log back in. Giganews members with VyprVPN have unlimited access to 47 server locations across North America, South America, Europe, Asia and Oceania. Golden Frog adds exciting new improvements for VyprVPN 2.6 for Windows and Mac and VyprVPN 2.5 for Android. If speed is your top priority, you can now choose "fastest server" and the VyprVPN app will automatically determine the fastest server and connect. You can also use "fastest server" in combination with auto-reconnect to ensure you always connect to the fastest server with every new VPN connection. 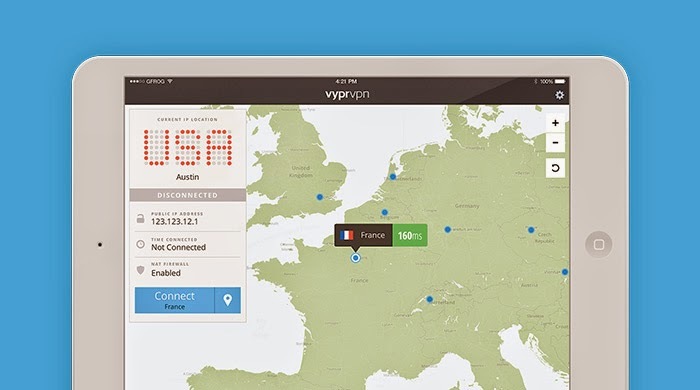 Golden Frog has published a new version of VyprVPN for iOS that includes a fix for iOS 8. The update also improves server connection time, making it faster than ever to connect to a VyprVPN server location. Please update your VyprVPN for iOS app to version 2.3.0.1238. Golden Frog Added a 7th U.S. VyprVPN Server Location in San Francisco! 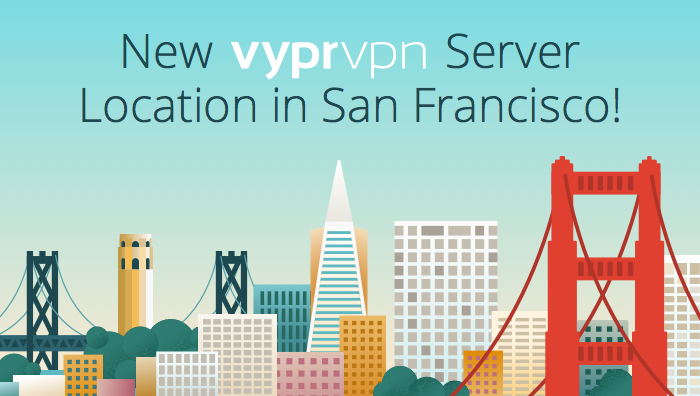 Golden Frog launched a new VyprVPN server location in San Francisco, California, USA. This is their 7th server location in the United States. Golden Frog offers unlimited VPN server switching and never throttles your connection. They have over 200,000 IP addresses so server connections are always available. VyprVPN Mobile - To enable San Francisco as an option using VyprVPN Mobile, simply log out of the app and log back in. Giganews members with VyprVPN have unlimited access to 46 server locations across North America, South America, Europe, Asia and Oceania. Golden Frog Added a 6th U.S. VyprVPN Server Location in Chicago! Golden Frog launched a new VyprVPN server location in Chicago, Illinois, USA. This is their 6th server location in the United States. Golden Frog offers unlimited VPN server switching and never throttles your connection. They have over 200,000 IP addresses so server connections are always available. VyprVPN Mobile - To enable Chicago as an option using VyprVPN Mobile, simply log out of the app and log back in. Giganews members with VyprVPN have access to 45 server locations across North America, South America, Europe, Asia and Oceania. Golden Frog added a new VyprVPN server location in New York! Golden Frog launched a new VyprVPN server location in New York, New York, USA. This is their 5th server location in the United States. Golden Frog offers unlimited VPN server switching and never throttles your connection. They have over 200,000 IP addresses so server connections are always available. VyprVPN Mobile - To enable New York as an option using VyprVPN Mobile, simply log out of the app and log back in. Brazil - São Paulo New! Mexico - Mexico City New! U.S. - New York New! How Does Heartbleed Affect Giganews Customers? Are Giganews Customers using VyprVPN Apps Safe from the Heartbleed Bug? Golden Frog's apps use OpenSSL 1.0.1e, which is vulnerable to the Heartbleed Bug, for OpenVPN connections. However, even though the apps use a vulnerable version of OpenSSL, customer information is not at risk. To be compromised, the apps would need to connect to servers that send malicious heartbeat packets. VyprVPN apps only connect to VyprVPN servers, which do not send malicious packets. Even if the VyprVPN apps were somehow tricked into establishing a connection with a malicious server, the apps do not possess any information they are not already sending to the server. There is nothing a malicious server could gather from the client that it wouldn't receive anyway. Golden Frog will be preparing updated versions of the apps that use non-vulnerable versions of OpenSSL, but at this time, Giganews customers are not at risk using the existing versions of the apps. At Giganews we take your privacy and security seriously. If you have any further questions please don't hesitate to contact our 24x7x365 support team via email or live chat. Golden Frog Added a New VyprVPN Server Location in Mexico! Golden Frog launched a new server location in Mexico City, Mexico! The new server location is available to use with PPTP, L2TP/IPsec, OpenVPN and Chameleon. VyprVPN Mobile - To enable Mexico as an option using VyprVPN Mobile, simply log out of the app and log back in. Golden Frog offers unlimited VPN server switching and never throttles your connection. They have over 200,000 IP addresses so server connections are always available. Protect your Internet connection while at home or on the go!